Mass Audubon works to protect the nature of Massachusetts for people and wildlife. Together with more than 100,000 members, we care for 35,000 acres of conservation land, provide school, camp, and other educational programs for 225,000 children and adults annually, and advocate for sound environmental policies at local, state, and federal levels. Founded in 1896 by two inspirational women who were committed to the protection of birds, Mass Audubon is now one of the largest and most prominent conservation organizations in New England. Today we are respected for our sound science, successful advocacy, and innovative approaches to connecting people and nature. Each year, our statewide network of wildlife sanctuaries welcomes nearly half a million visitors of all ages, abilities, and backgrounds and serves as the base for our work. To support these important efforts, call 800-AUDUBON (800-283-8266) or visit http://www.massaudubon.org. Central to our mission is reducing the threat of — and responding to — climate change. To lead by example, we are actively reducing our energy usage and demonstrating the use of renewable energy technologies. As a result of these efforts, we have cut our carbon emissions by more than 40% since 2003! 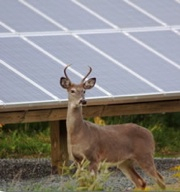 We have solar arrays located at our sites throughout Massachusetts. In this portal, you can explore the wildlife sanctuaries that are participating in this program. Use this resource to learn more about clean energy and what Mass Audubon is doing to reduce our impact.